I can't call myself 'Paris Pastry' without baking a Parisian pastry here and there. With my new cookbooks, I wanted to start off with something grand. Naturally you would think I chose Pierre Hermé, but Chapter 6 - Pastries from Martha Stewart's 'Baking Handbook', looked challenging enough. 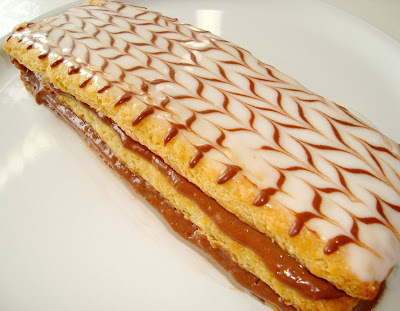 A picture of a chocolate Napoleon immediately catched my eye. "This famous French pastry is commonly known as mille-feuille (“a thousand leaves”). The name is believed to be derived from the term “Napolitain”, alluding to the tradition of layered desserts in Naples, Italy." 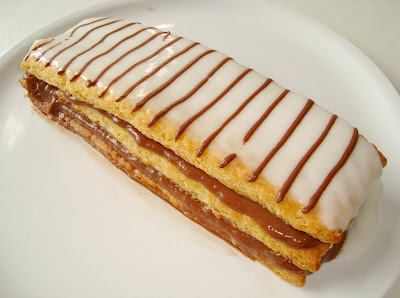 Ingredients: makes about 3 pounds, but you will only need 1 pound for the Chocolate Napoleon, so I divided the recipe for myself. This is the normal recipe that makes 3 pounds. - In a large bowl, combine 2 ¾ cups all-purpose flour with the cake flour, salt and sugar. - With a pastry blender, cut in the butter pieces (1 stick) until the mixture resembles coarse meal, with a few larger clumps remaining. - Make a well in the center, and pour in 1 cup cold water and the vinegar, gradually drawing the flour mixture over the water, gathering and combining until mixture comes together to form a dough. If the dough is too dry, add more cold water, 1 tablespoon at a time. - Knead gently in the bowl, and form dough into a rough ball. - Wrap in plastic, and refrigerate until well chilled, at least 40 minutes or up to 2 hours. - Sprinkle 2 tablespoons all-purpose flour on a sheet of parchment. - Lay remaining 4 sticks of butter on top, side by side; sprinkle with remaining 2 tablespoons flour. 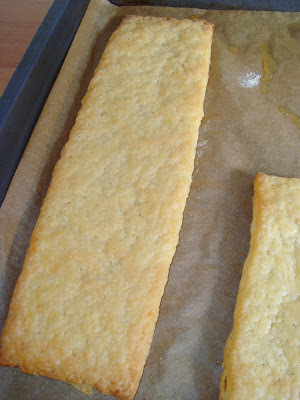 - Top with more parchment; pound butter with a rolling pin until it’s about ½ inch (1,3 cm) thick. - Remove top paper, fold butter in half, replace paper; pound butter until it’s ½ inch thick. - Repeat 2 or 3 more times until it is pliable. - Using a bench scraper, shape butter into a 6-inch (15 cm) square; wrap in plastic, and refrigerate until chilled, about 10 minutes. - Lightly dust work surface with flour. - Roll out dough to a 9-inch (23 cm) round; place butter package in center. - Using a parking knife or bench scraper, lightly score dough to outline butter square. - Remove butter; set aside. - Starting from each side of marked square, gently roll out dough to form 4 flaps, each 4 to 5 inches (10 to 13 cm) long; do not touch square. - Return butter to center square; fold flaps over butter. - Press with your hands to seal. - With the rolling pin, gently pound the dough all over in regular intervals until it is about 1 inch (2,5 cm) thick; this will soften the dough, making it easier to roll. - Working in only one direction (lengthwise), gently roll out the dough to a 20-by-9-inch (51-by-23-cm) rectangle, squaring corners with the side of the rolling pin or your hands as you go. - With a short side facing you, fold the rectangle in thirds like a business letter. - Turn the dough a quarter-turn clockwise, so the flap opening faces right, like a book. (sounds all very complicated, but it’s really easy) This completes the first turn. - Roll out the dough again to a 20-by-9-inch rectangle, rolling in the same lengthwise direction; fold dough again into thirds. This completes the second turn. - Wrap dough in plastic and refrigerate until well chilled, about 1 hour. - Repeat the rolling, turning and chilling process for a total of 6 turns; always start each turn with the opening of the dough to the right. - Wrap dough in plastic; refrigerate 3 to 4 hours before using the dough. - Use dough within a day, or freeze it for up to 3 months. Don’t leave puff pastry in the refrigerator for more than 1 day or it will lose its ability to puff properly in the oven. - On a lightly floured piece of parchment paper, roll out Puff Pastry to a 12-inch (30,5 cm) square, about 1/8 inch (0,5 cm) thick. - Using a pastry cutter or pizza wheel, cut squares into three 12-by-4-inch (30,5-by-10-cm) strips. - Transfer dough and parchment to a large baking sheet; prick over with a fork. - Cover with plastic wrap; chill in the refrigerator or freezer until firm, about 30 minutes. Mean while preheat the oven to 425°F/220°C. - Transfer sheet to oven; bake, rotating sheets halfway through, until pastry is puffed and golden around the edges, about 10 minutes. - Set another baking sheet directly on pastry strips (weird, I know) and continue baking until pastry is light golden in the center, 6 to 8 minutes more. - Remove top baking sheet; bake until pastry is baked through and golden brown, 6 minutes more. - In a small bowl, whisk together the sugar, butter (or shortening), corn syrup and 1 tablespoon milk. If the mixture is too thick to pour, add additional milk, 1 teaspoon at a time, until it reaches the consistency of sour cream. - Transfer a quarter of the glaze to a small bowl; whisk in cocoa. 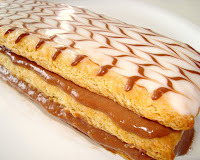 - Transfer chocolate glaze to a paper cornet; set aside. 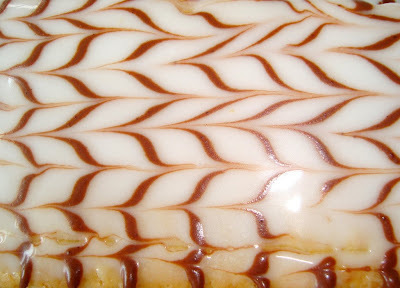 - Pour white glaze onto one of the pastry strips; spread evenly with an offset spatula. - Cut the tip of the paper cornet, and pipe lines of chocolate glaze crosswise over the white glaze, about ½ inch (1,3 cm) apart. - Drag the tip of a wooden skewer down the length of the glazed strip, in alternating directions, to create a decorative pattern. - Pipe an even layer onto another pastry strip. - Top with the remaining pastry strip, pressing gently to secure. 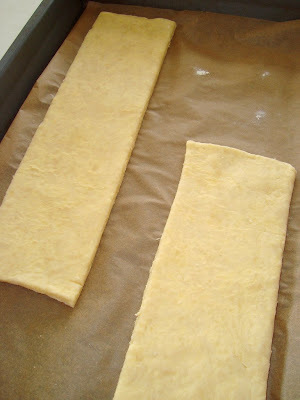 - Fill the pastry bag with the remaining pastry cream, and pipe evenly onto the strip. - Place the glazed pastry on top. - Once assembled, the Napoleon is best eaten the same day; slice with a serrated knife. - In a medium saucepan, combine the milk, ¼ cup sugar, vanilla bean and seeds, and salt. - Cook over medium heat until mixture comes to a simmer. - In a medium bowl, whisk together the egg yolks, cornstarch, and remaining ¼ cup sugar. 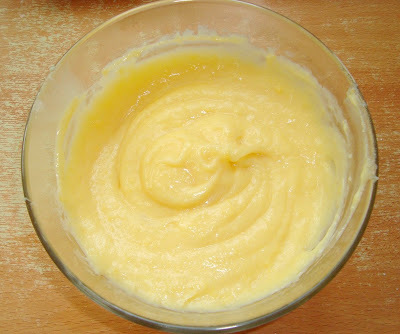 - Whisking constantly, slowly pour about ½ cup of the hot-milk mixture into the egg-yolk mixture. Continue adding milk mixture, ½ cup at a time, until it has been incorporated. - Remove and discard vanilla bean. - Transfer to the bowl of an electric mixer fitted with the paddle attachment. Before turning into chocolate pastry cream, it was a yummy vanilla pastry cream. I took many more pictures of everything, especially the puff pastry making-process, so if you want to try out this recipe and see my photos, just e-mail me, I'd be happy to send them! It's a lot of work but the finished product looks fabulous. oh i love lille feulle and this looks so good. Great job! I've just found your blog on Sue's (wee birds) blog and I'm so glad that I have. It's been a joy to read and I can almost taste those yummy cakes. I've been drooling over that martha stewart's baking handbook but also still tossing about buying it..I've read the amazon.com review but..errr..I'm a bit not sure..please write your review about that book.. Puhleeease? I'm begging??hehehe.. Wow! Good job getting through all that - it looks like a very long process. But the end result looks delicious! I have been wanting to make puff pastry for the longest time!Especially napaleon...as my hubby loves it! Would you mind to share your recipe step by step photos with me?My email is hi_v_v@hotmail.com. Ivy, I send the pictures! Because I attached some files with it, there's a good chance my email ended up in your junk mailbox. Thank you so much!Pictures received!they were so detailed....:)but i have another question, if I were to 1/3 the recipe for pastry, are the measurements of dough all suppose to be 1/3 of actual(eg. thickness,length)? Also, for your 1/3 of puff pastry,how big a pastry did it yield? Try using this patter on a cupcake or something round and you will get a spider web looking like pattern. it's so lovely !